Public Art League is proud to announce the installation of Fettle, a sculpture by Luke W. Achterberg, Friday, September 20th. 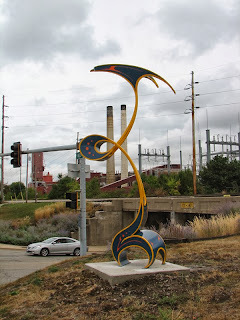 The sculpture was installed on the corner of Neil Street and Stadium Drive in Champaign. 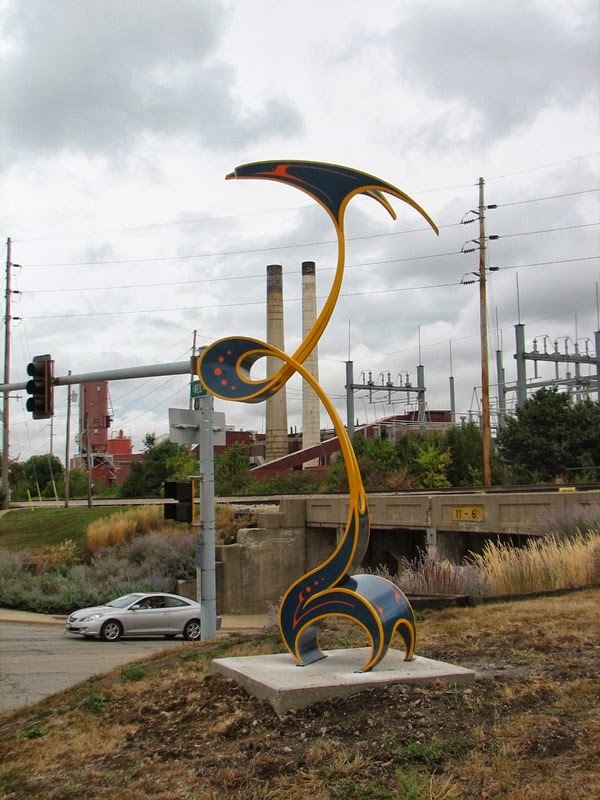 Fettle represents the 35th sculpture Public Art League has brought to the community, and its installation is possible thanks to the generous support of Champaign Telephone Company, and Michael & Connie Hosier. Sculptor Luke W. Achterberg exhibits both indoor and outdoor work throughout the United States and Switzerland. He obtained his M.F.A. from the University of Kentucky, where he also received the Outstanding Student Achievement in Contemporary Sculpture award from the International Sculpture Center. Since that time, he has been teaching sculpture and ceramics at Morehead State University, and completing a residency at Art-St-Urban in Switzerland. He maintains his studio in Lexington, Kentucky, where he recently completed a body of work for a solo exhibition with Kathryn Markel Fine Arts in New York City. Fifteen years ago, Urbana native and University of Illinois alum Roger Ebert started a film festival in Champaign-Urbana to share his love of film with the community, and share his community with those who loved film. His passing was a great loss to all of those fortunate enough to have known him, but his memory lives on through his friends and family, the work of his wife Chaz, and the continuation of Ebertfest. Today, Scott Anderson announced the kick-off of a new tribute to the hometown hero. 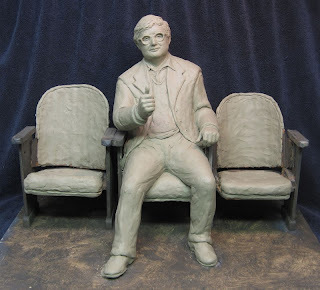 As head of the Roger Ebert Sculpture fundraising campaign, Scott Anderson presented its mission to commission and install a life-size bronze sculpture of Roger Ebert on the plaza outside the historic Virginia Theater, home of Ebertfest. This fundraising campaign offers the citizens of our communities and movie fans everywhere an opportunity to share in celebrating Roger Ebert's contribution to the movie industry, the culture of Champaign-Urbana and some of the joy we have experienced in our own lives while watching films. The sculpture will be a permanent memorial which will honor Ebert for both his career and his dedication to his roots. It will also honor him for his determination to press forward with Ebertfest in the face of huge medical challenges. The sculpture will be created by artist Rick Harney of Bloomington, Illinois. It will be made of bronze and will be life size. It will depict Roger Ebert sitting in the middle of three theater seats displaying his signature "thumbs up" gesture. Roger’s widow, Chaz Ebert, was unable to attend the press conference due to a scheduling conflict, however she has selected the composition of the sculpture and is providing the artist input to enable him to depict Roger at the stage of his life which she desires. Many people and entities are contributing to this sculpture effort. These include the cities of Champaign and Urbana, the College of Media of the University of Illinois at Urbana-Champaign, the Champaign Park District, the Community Foundation of East Central Illinois, and the Public Art League. Together, they are hoping to raise approximately $125,000 for the commissioning, building, and installation of this sculpture. One can make donations directly to the Community Foundation of East Central Illinois or through the web site: Ebertsculpture.org. The web site has more information concerning the formulation of the idea, Roger Ebert’s career, the artist’s bio, the sculpture itself and how to donate.